A CHANGE in ownership or management often gives a building a lift and a fresh image in line with the market it caters for. In the case of Nomad SuCasa All Suite Hotel, the takeover by the Nomad Group brought renovation and upgrading works to the residences, facilities, and the only F&B outlet, injecting new life into, the place formerly known as the Sucasa Service Apartment. It new functions like a hotel, offering comprehensive services and facilities, including meeting rooms for seminars, conferences and exhibitions. 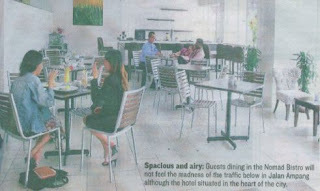 The Nomad Bistro is now a more spacious and airy outlet where guests can enjoy all-day dining. According to the hotel's marketing communications manager, Avyanna Charlize Kek, the bistro has been open for nine months now and has drawn a stream of guests who like the place for its relaxing feel. "The bistro is next to the poolside. When guests come here, they don't feel the madness of the traffic below in Jalan Ampang. "We are located in the city but there's this out-of-city atmosphere for guests," Kek said. The bistro's menu features local and Western fare, and it stocks wine and liquor. "Our selection is just nice, and not too wide. This allows us to maintain the food quality." Restaurant manager Joanna Leong said: "Our menu is about easy, traditional food that guests are already familiar with. This is to cater for the many expatriates who stay here, usually for months. "We also have a lot of families as guests," Leong said. One of the sandwich options is the Jumbo Croissant Tuna Melt. The chef's speciality features tuna salad on toasted croissant that is gratinated. "Our croissants are delivered fresh every morning. We order just 25 pieces for the day, to avoid leftovers and wastage and to maintain freshness and quality. "It's a value-for-money portion at RM16, as we use chunky tuna," she said. For Malaysian flavours, the Nasi Lemak is recommended as a must-try. The steamed rice, fragrant with coconut milk, is served with a deepfried whole chicken leg (thigh and drumstick) that is drizzled over with special masala gravy. "The masala gravy is cooked every two days so the volume is kept small," she added. Leong said if one had reservations about eating the cocom milk-rich rice, it was be., that they not eat nasi lemak at all. "There is no real nasi lemak without coconu milk," she said. For something Western, the Grilled Rosemary Lamb Chop or the Salmon Steak, both the chef's specialities, are recommended. The lamb chops are cut from lamb racks (each lamb rack gives about six servings, although this may vary depending on size). The lamb chop is marinated in balsamic vinegar and served with garlic mash and coponata sauce. "We use fresh rosemary herb to season the lamb overnight before adding balsamic to bring out the flavour, while neutralising the smell of the meat to some extent. "Without the smell, you cannot really call it lamb," she said. The Salmon Steak is pan-seared Norwegian salmon with herb butter sauce served with vegetable. Priced at RM24, the serving is value for money as it is a thick steak weighing approximately 200gm. To accompany your meals, try beyerages like Bistro Breeze an6 SuCasa Sunset. For something different, the Ice Peppermint Tea is a refreshing beverage, especially during the current hot spell; the mint is not too strong, and the drink tasted slightly sourish. Leong explained that the base was fleshly made lemon tea, and there was a top layer of ice-blended-like-foam. The bistro also offers catering services for any funcion or occasion. * The nomad bistro, the nomad sucasa all-suite hotel,222, Jalan Ampang, Kuala Lumpur (Tel:03-42513833 ext457). Business hours:Daily, 7am to 11am. * This is the writer's personal observation and is not an endorsement by Malaysia123.com.